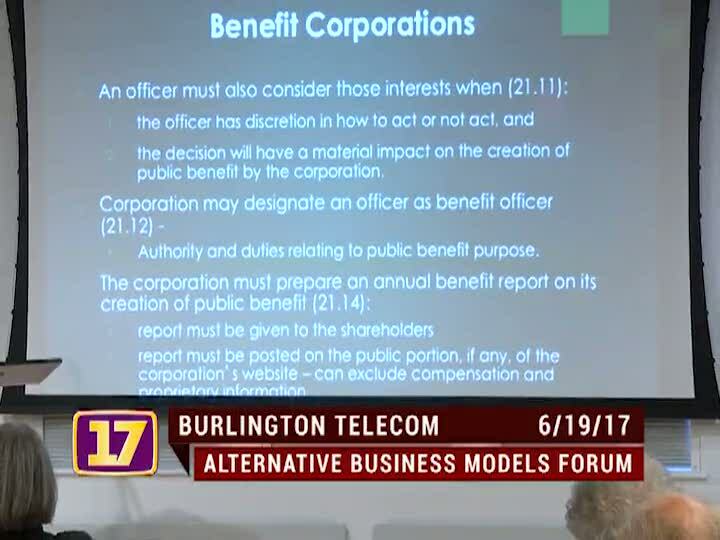 City Council President Jane Knodell sponsors "Alternative Models for Burlington Telecom Forum" featuring Roberta MacDonald, Senior Vice President of Marketing, Cabot Creamery Cooperative and Kenneth Merritt, who led the drafting of the Vermont Benefit Corporation ("B Corp") legislation. Burlington Telecom is about to be sold. The question is, to whom -- A typical corporation or someone else? The City has received 8 bids to buy BT, representing a variety of business models. This event informs City councilors, BTAB (Burlington Telecom Advisory Board), and the general public about the benefits and costs of alternatives to the typical corporate model.